This is a sponsored post for Nielsen-Massey®, but all opinions and ideas are my own. As January dwindles away and we are less likely to write “2017” by accident, we’re getting securely into 2018. I’m not one for resolutions, but I do like thinking about trends. So… what will be the food trends of 2018? I’ve been blogging for over a decade now, and part of this job is following, creating, and trying to stay ahead of fun food trends. I fully embraced the rainbow and unicorn food fads. (Ahem, did someone say rainbow and unicorn food?) But I believe 2018 will bring a softening of extreme foods. I have also felt, and my readers are clear on this too, social media is over-saturated with dramatic foods… too much unicorn-themed everything. Too much glitter! Too much one-upping of dramatic food. Rather than continue to the extreme, I predict a toning-down of fun food, a move to pastels and gentler, calming flavors, such as tea and floral-themed foods. 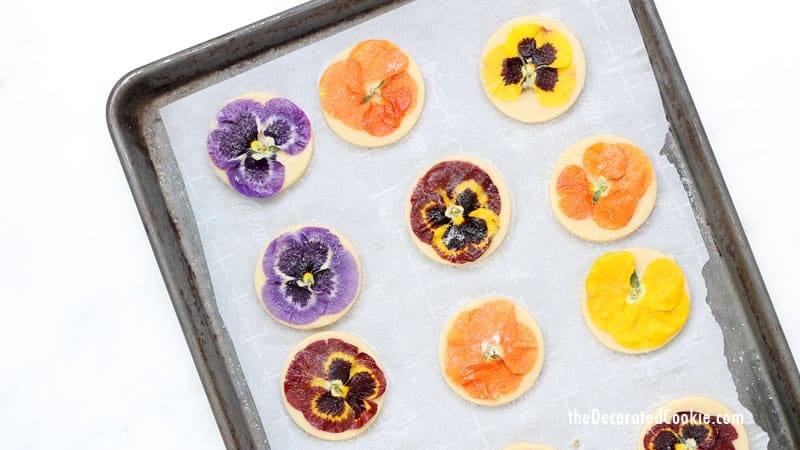 And, so enter these gorgeous, delicately-flavored orange floral cookies. 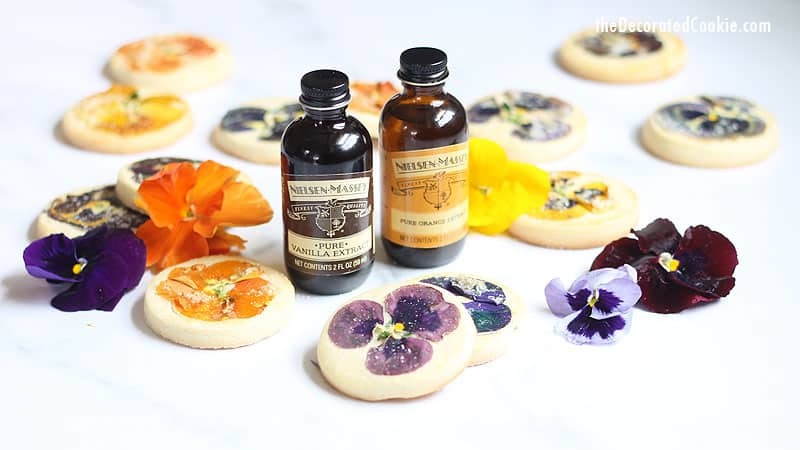 For this recipe, I recommend Nielsen-Massey’s Pure Orange Extract and Nielsen-Massey’s Pure Vanilla Extract. I’ve used their flavors and extracts for years, and they are my favorites because of the consistent high-quality. 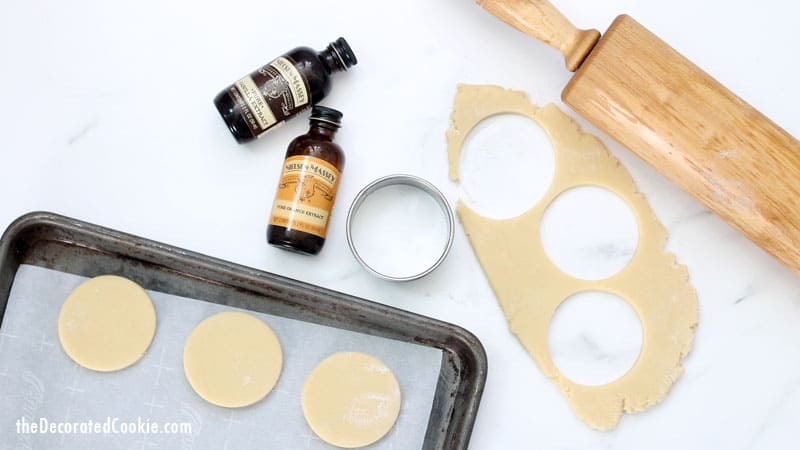 Bottles of the Pure Vanilla Extract go the most quickly in my house. This family-owned company uses as few ingredients as possible to let the vanilla’s natural essence shine (they use a proprietary cold extraction process instead of heat extraction to preserve all of the 300-plus distinctive flavor compounds present in vanilla beans, and all the beans are examined by hand, bundle-by-bundle, so they really are of the finest quality you can get). And Nielsen-Massey products are all-natural, GMO-free, certified gluten-free, certified Kosher, and allergen-free so… yeah. Best extracts ever. Their vanilla extract is a staple, of course, but I don’t have a chance to use my orange extract as much. (Note to self: Find more reasons to use orange extract. It goes well with jams, ice cream, desserts, and even savory dishes, such as rice, chicken and fish, so why am I not using it more?!) 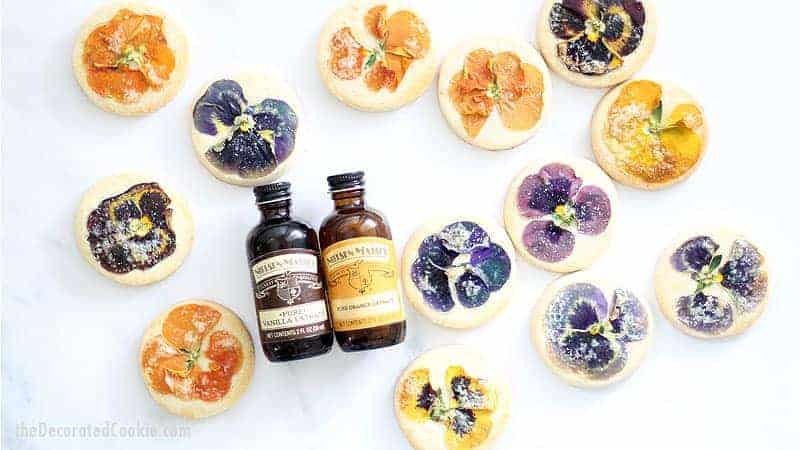 These edible flower cookies were the perfect opportunity to pull out my bottle. The orange extract offers pure flavor to the cookies without having to take the time to chop, zest or juice. It’s just the right amount and just the right flavor. 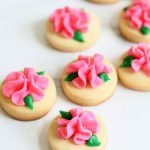 And I thought it would go nicely with this new softer-themed, floral cookie. Turns out… it does. Ohmygosh, these are so so good. 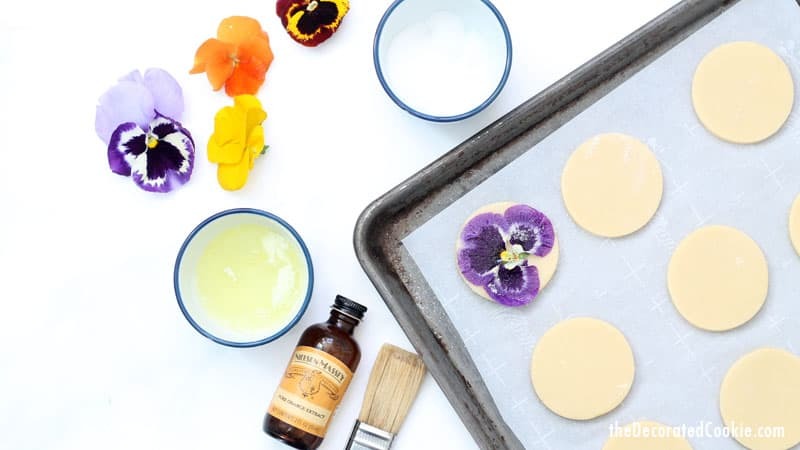 Cooking with edible flowers is an idea centuries old. (Apparently, they were popular in the Victorian era.) I think they are making a comeback. I found my flowers online. Shipping is expensive, because it’s next-day, but worth it for the quality of flowers you get. Closer to spring, you should be able to find them at natural food stores or even your own supermarket. You can grow and use your own flowers, as long as you, of course, use no pesticides or any harmful chemicals. Before choosing flowers to add to your food, do a quick google search to make sure it’s on the edible flowers list and rinse them thoroughly. Some popular flowers that are considered edible: Begonia, calendula, carnations, chrysanthemums, cornflower, dandelions, day lilies, gladiolus, hibiscus, honeysuckle, impatiens, lilac, marigold, pansy, primrose, Queen Anne’s lace, roses, scented geraniums, sunflower, and violet. 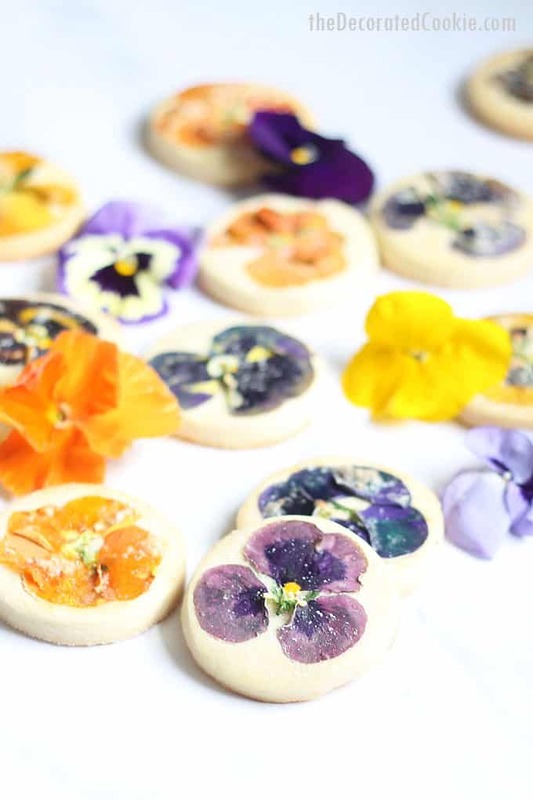 Feel a little unsure about edible flowers? The flavor and texture of these cookies strikes an ideal balance. 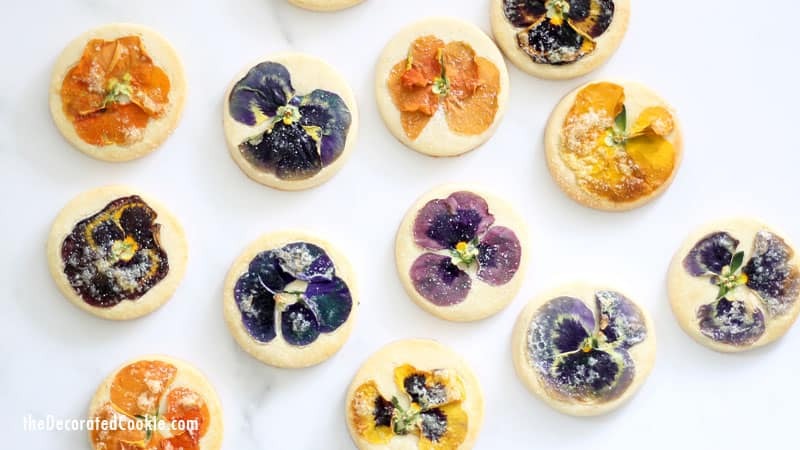 The flower becomes just a wafer-then, sweet “icing” to the orange-tinged shortbread cookie. I promise. You’ll get over the wariness with the first delicious, sugary-orange bite. And the beauty of these cookies is well worth it. Make sure to follow Nielsen-Massey on Facebook, Twitter, and Instagram for more recipe ideas! In a bowl, briefly whisk together the flour and salt. Set aside. In the bowl of a standing mixer fitted with the flat beater (or in a large bowl with a hand mixer), blend the butter and confectioner’s sugar. Mix in the egg and extracts until well-blended, scraping the sides of the bowl. Gradually stir in the flour mixture. Chill dough for 30 minutes. Preheat oven to 375 degrees F (190 degrees C). Line a baking tray with parchment paper. On a floured surface, roll out your cookie dough 1/4-inch thick. Cut out circles and place on the baking tray. Add a dash of the orange extract to the egg white and briefly whip with a fork. Brush a circle with the egg white-extract mixture. 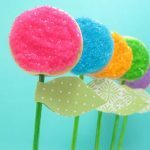 Snip the stem of an edible flower to make the flower as flat as possible and place on the cookie, gently pressing the petals flat. If the petals separate when the stem is snipped, just piece them back together. 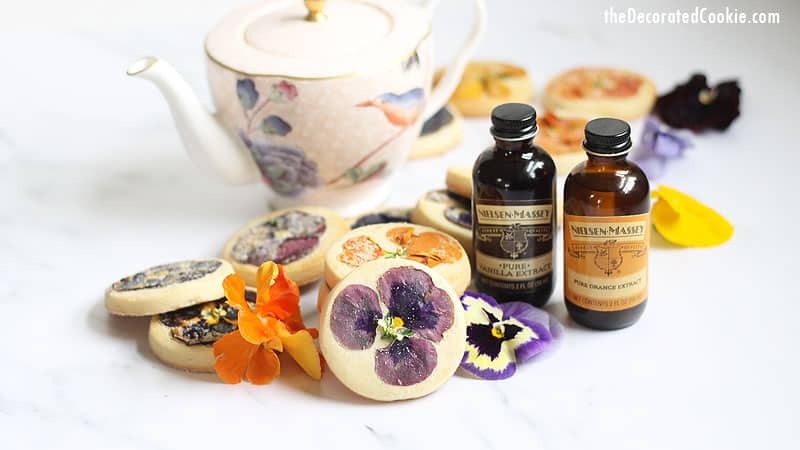 Carefully brush the top of the flower with the egg white-extract mixture and sprinkle with a pinch of sugar. Fill your tray and bake until the edges begin to brown, 12 to 14 minutes. In a bowl, briefly whisk together the flour and salt. Set aside. In the bowl of a standing mixer fitted with the flat beater (or in a large bowl with a hand mixer), blend the butter and confectioner's sugar. Mix in the egg and extracts until well-blended. Gradually stir in the flour mixture. Chill dough for 30 minutes. Preheat oven to 375 degrees F (190 degrees C). Line a baking tray with parchment paper. On a floured surface, roll out your cookie dough about 1/4 inch thick. Cut out circles and place on the baking tray. Brush a circle with the egg white (optional: Add a dash of the orange extract to the egg white). 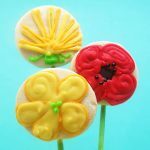 Snip the stem of an edible flower to make the flower as flat as possible and place on the cookie, gently pressing the petals flat. If the petals separate when the stem is snipped, just piece them back together. Carefully brush the top of the flower with egg white and sprinkle with a pinch of sugar. Fill your tray and bake until the edges begin to brown, 12 to 14 minutes. This post for orange cookies with edible flowers also appears on Food Fanatic. Hello, can these cookies be frozen once they’re baked? Will freezing the cookie compromise the color of the flower? Hi Tina, Great question! The cookies themselves freeze very, very well. However, I have NOT tried freezing with the flowers. 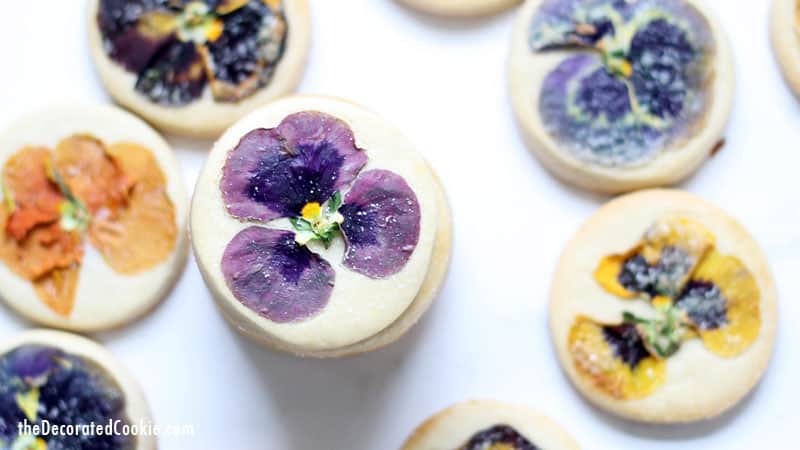 My worry would be that as the cookies thaw, the flowers would be compromised. That’s a guess, but I would be wary, I think.